New Delhi, Aug 24 (IANS) India and Nepal on Thursday signed eight agreements across different sectors, including four on post-earthquake reconstruction in the Himalayan nation. “Establishing new mechanisms for collaboration. 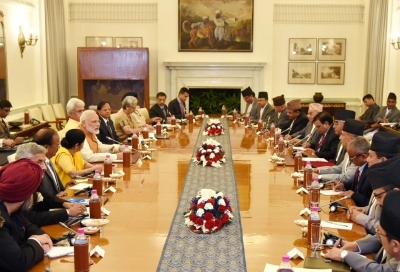 #IndiaNepal exchange agreements to strengthen cooperation in various spheres,” External Affairs Ministry spokesperson Raveesh Kumar tweeted following delegation-level talks here headed by Prime Minister Narendra Modi and his Nepali counterpart Sher Bahadur Deuba. With India committing $1 billion in reconstruction aid following the April 2015 devastating earthquake in Nepal that claimed nearly 9,000 lives, four memorandums of understanding (MoUs) were signed on utilisation of housing grant component to support reconstruction of 50,000 houses, and implementation of reconstruction packages in the education, cultural heritage and health sectors. Another MoU was signed for implementation arrangement on cost sharing, schedules and safeguard issues for construction of Mechi bridge under the Asian Development Bank’s South Asia Subregional Economic Cooperation (SASEC) road connectivity programme (Tranche 2), funded by India. A sixth MoU was signed on drug demand reduction and prevention of illicit trafficking in narcotic drugs, psychotropic substances and precursor chemical and related matters. A seventh MoU was signed on cooperation between the Institute of Chartered Accountants of India and the Institute of Chartered Accountants of Nepal. The two sides also signed an agreement on cooperation in the field of standardisation and conformity assessment. 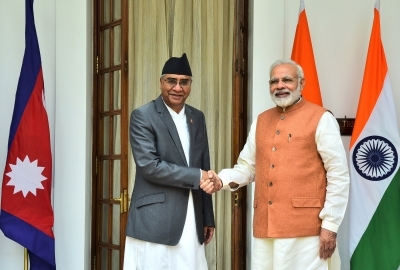 Prime Minister Deuba, heading a high-level delegation, arrived here on Wednesday on a five-day visit to India. It is his first foreign trip after assuming office in June this year and the fourth to India as Prime Minister.